EARTH’S MAGNETIC FIELD IS CHANGING: Anyone watching a compass needle point steadily north might suppose that Earth’s magnetic field is a constant. It’s not. Researchers have long known that changes are afoot. The north magnetic pole routinely moves, as much as 40 km/yr, causing compass needles to drift over time. 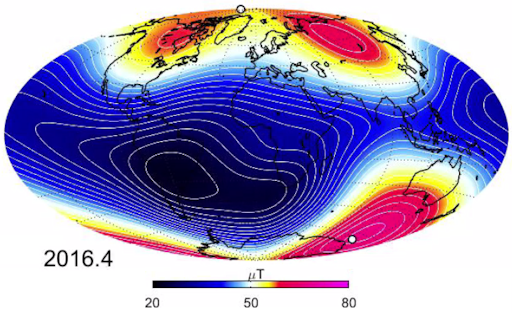 Moreover, the global magnetic field has weakened 10% since the 19th century.